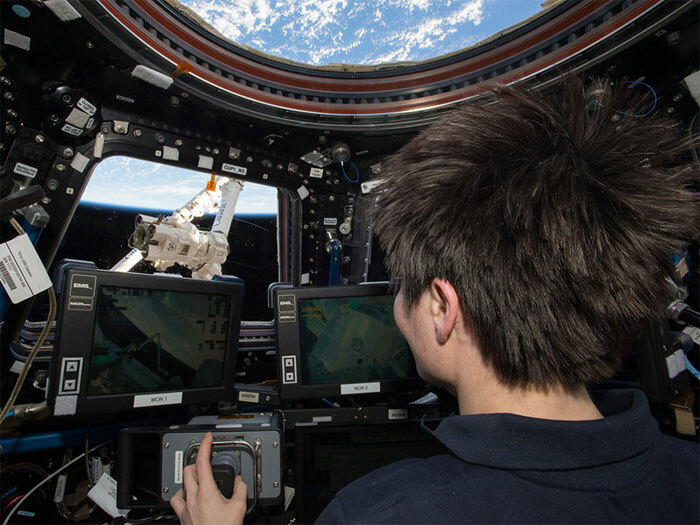 Astronaut Samantha Cristoforetti operates the Canadarm2 from inside the cupola. The SpaceX Dragon commercial cargo craft is less than a day away from arriving at the International Space Station. The Expedition 43 crew is getting ready for its arrival and five-week stay at the Earth-facing port of the Harmony module. Commander Terry Virts set up hardware inside Harmony to assist Dragon’s installation after its capture tomorrow. Virts and Italian astronaut Samantha Cristoforetti also brushed up on robotics skills necessary to capture Dragon with the Canadarm2. NASA TV will begin rendezvous coverage Friday at 5 a.m. EDT. Dragon is scheduled to be grappled about 7 a.m. by Cristoforetti inside the cupola at the controls of Canadarm2 with Virts assisting. Though it was a light day, the rest of the crew worked on human research and advanced microgravity experiments. Dragon is also delivering new science gear to support hundreds of experiments aboard the orbital laboratory. While the International Space Station was traveling 257 statue miles over the Pacific Ocean just east of Japan, Expedition 43 Flight Engineer Samantha Cristoforetti of the European Space Agency, with the assistance of Expedition 43 Commander Terry Virts of NASA, successfully captured the SpaceX Dragon spacecraft with the station’s robotic arm at 6:55 a.m. EDT. 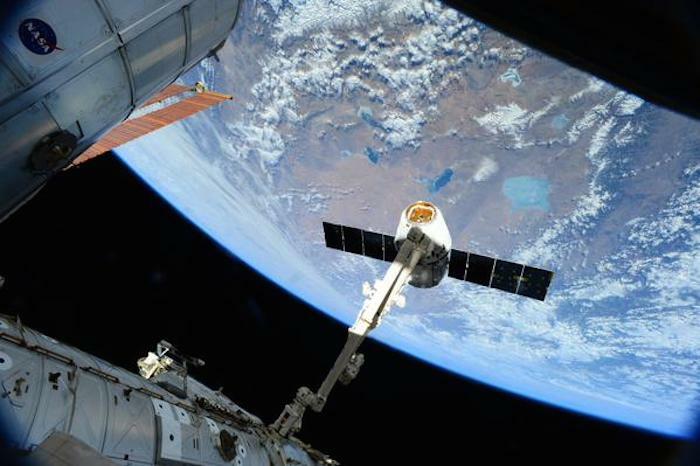 Operations to berth Dragon to the space station begin at approximately 9:40 a.m. The SpaceX Dragon cargo spacecraft was berthed to the Harmony module of the International Space Station at 9:29 a.m. EDT. The hatch between the newly arrived spacecraft and the Harmony module of the space station is scheduled to be opened Saturday. The spacecraft is loaded with more than 4,300 pounds of supplies, science experiments, and technology demonstrations, including critical materials to support about 40 of more than 250 science and research investigations during the station's Expeditions 43 and 44. 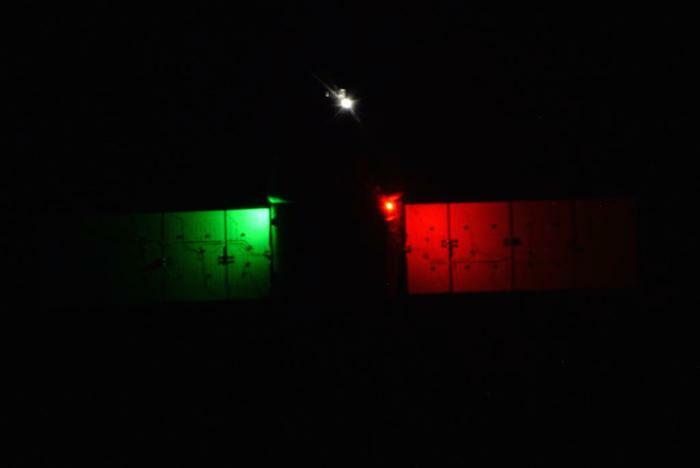 A SpaceX Dragon cargo ship loaded with more than two tons of equipment and supplies rendezvoused with the International Space Station early Friday and was captured by Italian astronaut Samantha Cristoforetti, using the lab's robot arm, to wrap up a smooth three-day rendezvous. 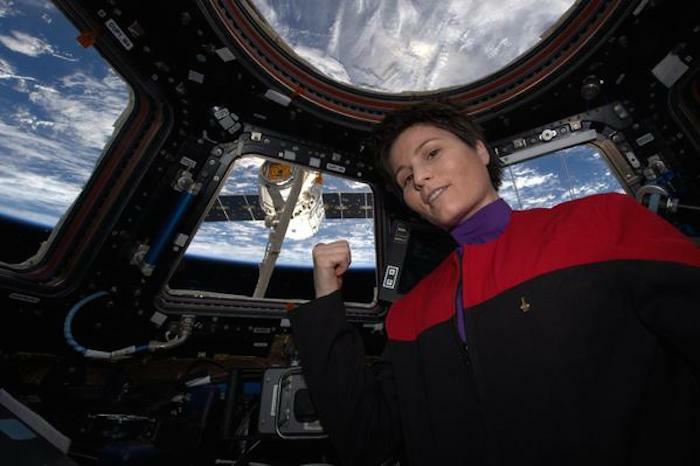 A few minutes later, after putting on a "Star Trek: Voyager" tunic, Cristoforetti channeled the TV show's Captain Janeway, tweeting "There’s coffee in that nebula … ehm, I mean… in that #Dragon." Packed inside the supply capsule, along with nearly 4,400 pounds of equipment, research gear and supplies, was an Italian-built espresso machine, a welcome addition to the crew's kitchen. 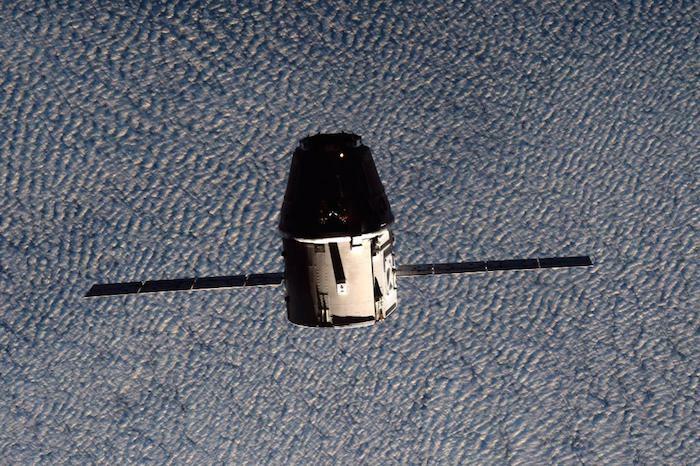 Deftly operating the station's robot arm, Cristoforetti snared a grapple fixture on the side of the Dragon capsule at 6:55 a.m. EDT (GMT-4) as the station passed 260 miles above the Pacific Ocean east of Japan. "Houston, capture is complete," station commander Terry Virts radioed. "Samantha did a perfect job grappling Dragon." With the Dragon secured, flight controllers took over arm operations and remotely pulled the spacecraft in for berthing at the Earth-facing port of the station's forward Harmony module. "Just wanted to say thank you to the folks at SpaceX and you guys in Houston," Cristoforetti called down. "It's just been amazing, watching the launch and knowing it's heading our way and sure enough came knocking at our door. It was steady as a rock, and we're just very, very happy to have it here." 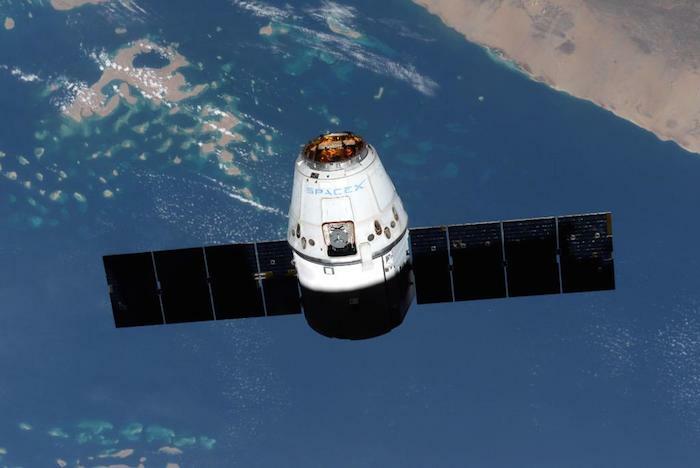 If all goes well, the station crew will open hatches to the Dragon early Saturday to begin unloading research gear, supplies and other equipment, including an espresso maker supplied by Italy. "It's going to be busy, but lots of science, and even coffee is in there, so that's pretty exciting," Cristoforetti, an Italian astronaut, told mission control. "So again, thanks a lot, and great job everybody." This is SpaceX's sixth operational resupply flight under a $1.6 billion contract with NASA that calls for a dozen flights to deliver some 44,000 pounds of equipment and supplies. For the latest flight, the capsule was loaded with 1,142 pounds of station hardware, 1,860 pounds of science gear, 1,102 pounds of crew supplies and another 86 pounds of computer gear and spacewalk equipment. Also on board: 20 mice serving as test subjects in research to learn more about the effects of weightlessness bone loss and muscle atrophy. 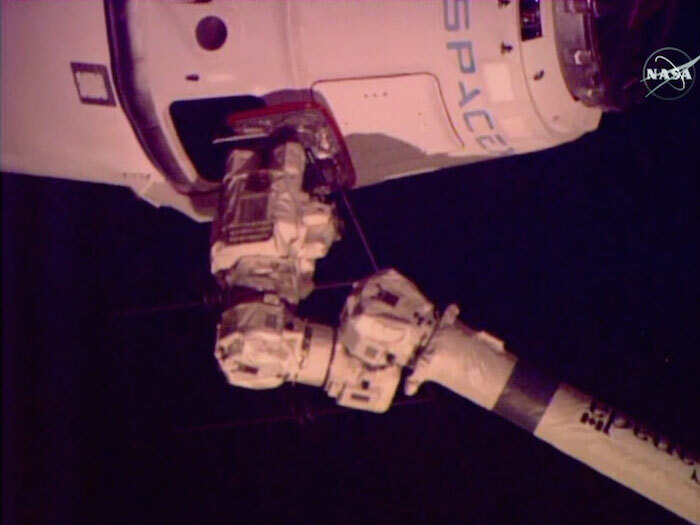 The Dragon will remain attached to the station for a bit more than a month. By the time it departs in late May, the station crew will have repacked the capsule with more than 3,000 pounds of research samples, no-longer-needed equipment and trash. 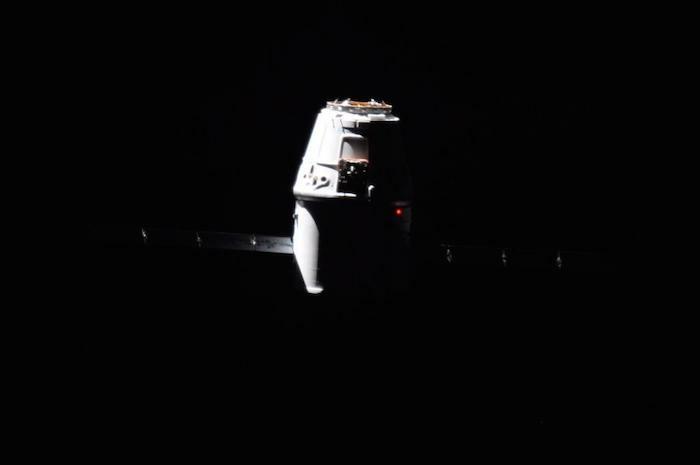 The Dragon is the only cargo ship currently flying to the station that is capable of bringing material back to Earth.